It’s the final week of Marathon Month, a time we get to spotlight our patients who are running this year’s TCS New York City Marathon! In this entry we share the story of a special SPEARunner treated at our Chelsea location: 51-year-old Kenneth Festa. He has battled through a torn Achilles with Laura Muzzatti, DPT to walk his 13th NYC marathon! Determined to complete 15 marathons by 2016 to qualify for lifetime entry, Kenneth is the epitome of grit and SPEARIT! Why do you run? I run for all of the usual reasons…health, fitness, problem-solving, family time (my wife and two sons are both runners), to get to work without having to use the subway (I live about 6 miles away from my job), and because people were just plain born to run. How long have you been running marathons? I’m 51, and I think I did my first marathon when I was 30, so a little over 20 years. I’ve done 16 of them, in total. Which physical therapist do you see at SPEAR and what treatments have you been doing for training? I primarily see Laura (although I’ve had others in the office work with me, and they’re all excellent!). Been doing a lot of calf raises, balance exercises, massage, and flexibility exercises. Laura has encouraged me to supplement my PT program with yoga and barefoot conditioning workouts. Do you have any words of wisdom or training tips for anyone thinking about doing their first marathon? Words of wisdom for a first timer? Enjoy it. Enjoy every minute. You may have last-minute doubts–a little voice might whisper in your ear that you’re not meant to be a marathoner, that you should have done a couple more long runs, and more stretching, and more strength training. 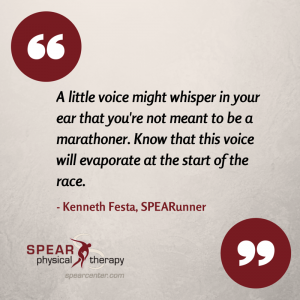 Know that this voice will evaporate at the start of the race, and you will feel like a superhero (at that point, don’t get too overconfident–relax and flow easily through the first half of the race). When you’re done, you’ll be a marathoner for the rest of your life! More than earning that achievement, though, you’ll learn something about yourself… I’m planning to learn a little acceptance and humility in the 2014 NYC marathon. This past spring, I was running the best that I can remember, attaining age-graded percentages that I’d never reached in over a hundred NYRR races. I was beginning to think about (possibly) qualifying for Boston for the third time (not an easy goal for me). Then, in late May, I had a surfing accident and completely ruptured my Achilles. Even as I was lying on the surfboard just after it happened, I knew what I’d done, and I could see my marathon drifting out to sea. In the emergency room, they basically told me to forget about the 2014 NYC marathon. I had another thought at the time–related to the fact that if you do 15 NYC marathons, then you have guaranteed entry for the rest of your life. I’ve done 13. They’re ending that program in 2016…so I’d still be able to get my 15 using the 2015 and 2016 races. But there’d be no more room for error. No more surfing accidents. I spent a couple of days feeling sorry for myself (I’m not proud of that, but I’m human). Then I had a thought …if Zoe Koplowitz, who has severe MS and uses a walker, can do the marathon in 30 hours, then I can walk it in 10. If you don’t know about her, see her website at www.zoekoplowitz.com. She’s a wonderful lady, a real NYC treasure and an inspiration to many. Laura was the first person to tell me that walking the marathon this year might be possible, that it wasn’t the dumbest thing she’d ever heard. Important: She made me promise not to tell my doctor that she’d just cleared me to do a marathon, because she hadn’t. But if I could get approval from my doctor, then she’d help me work toward that goal. When I ran it by him in September, he assessed my progress (he was very impressed by the strength I’d regained in the foot), shook his head and said that no one had ever asked him if they could do a marathon 5 months after Achilles tendon repair. Then he said yes, but I need to stop if my heel starts hurting. Deal! So, yeah, it’s been a huge amount of physical work, from taking those first few halting steps in my living room in August, to my longest walk of 21 miles, around the perimeter of most of the island of Manhattan. Just as hard, though, has been learning to accept my limitations. I’m not a great runner, and never have been, so I didn’t think it was that big a part of my ego. I learned otherwise in the 5th Avenue Mile race this past September. I needed to do a few more races to qualify for the 2016 marathon, using the NYRR Club’s 9+1 entry path. To put it in perspective: in a race in April, I came in 20th out of over 200 guys in my age group. In the 5th Avenue Mile, I came in 3rd from last out of 5200 athletes. The sidewalks were crowded with spectators, and they were encouraging me to run (which I couldn’t) and the race course was empty, because all of the other runners in my heat were long gone. There was just nowhere to hide. I had to keep my head up, keep smiling, and keep walking. It was one of the hardest things I can remember doing. Surgery was WAY easier. I expect that I’m going to encounter a longer, harder version of that experience on November 2nd. And I think it will be good. As Zoe Koplowitz says, you can either go through life with your arms open, or you can go through life with your arms closed. I’m going to try my level best to embrace this marathon with my arms open. It’s still an immense privilege. 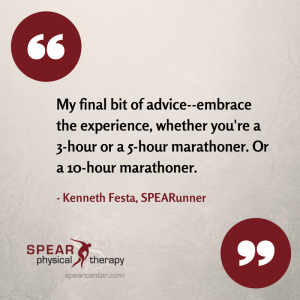 And that would be my final bit of advice–embrace the experience, whether you’re a 3-hour or a 5-hour marathoner. Or a 10-hour marathoner. It’s Marathon Month, a time when we get to spotlight our patients running this year’s TCS New York City Marathon! 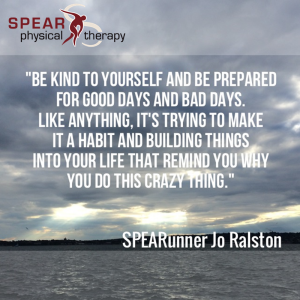 In this entry we we check in with a SPEARunner Maxx Frost who’s being treated at our Midtown 44th Street location by SPEAR physical therapist Brendan Vint, DPT. Maxx is now stronger than he was prior to his injury and is excited about running his very first marathon! Why do you run? I never used to be much of a runner; it’s only in the last two years that I’ve really taken it up. But I’m glad that I did, because it’s a great stress reliever and an awesome way to challenge yourself. Plus, I really enjoy spending the time outside, because it’s so easy to get cooped up indoors in NYC. To me, there’s nothing better than clearing your head, running out your stress and pushing your limits on a weekend run in Central Park. How long have you been running marathons? This year’s New York City Marathon will be my first! Running the New York City Marathon is something that I’ve always wanted to do and I’m so exited to do it this year. Which physical therapist do you see at SPEAR and what treatments have you been doing for training? Brendan is my physical therapist at SPEAR. I started coming to Brendan last year after a right knee injury. He helped me heal from the injury and come back stronger, faster and more fit than ever. This year, he’s been helping me stay injury-free during my marathon training and has also helped me continue to strength train. The most important thing I’ve learned from Brendan is that running is so much more than good cardio fitness. We’ve worked on a lot of hip and leg flexibility, proper stretching and foam rolling, and building muscle to support my hip and knee joints. Flexible joints and strong muscles to support them can really propel you to the next level once you start hitting your very long runs. Do you have any words of wisdom or training tips for anyone thinking about doing their first marathon? Go for it! But know that training for your first marathon is a big commitment, since the amount of conditioning your body goes through is truly remarkable. There are early morning runs and late night gym sessions, aches and pains. Training can at times be a struggle. But you need to embrace that struggle, and push yourself through it, because that’s the real accomplishment of training. Knowing you can push yourself through physical and mental adversity and come out of it successfully brings a huge sense of pride. That sense of pride and accomplish makes it all worth it. It’s our second annual Marathon Month, a time we get to spotlight our patients who are running this year’s TCS New York City Marathon! 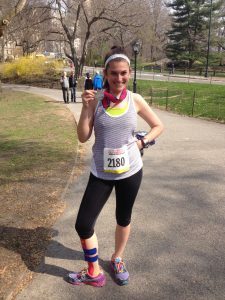 In this entry we check in with 16th Street SPEARunner Ilana Epstein, who will be running her second NYC Marathon in November! Why do you run? I run because of how amazing it makes me feel. It is one of the few things that can make me forget about everything else and just live in the moment. I love being outside and seeing how far I can push myself. Running marathons is something that I never imagined I could do and I love the feeling of accomplishment that it provides. How long have you been running marathons? I ran my first marathon in 2011. As soon as I finished I couldn’t wait to do another one. I trained to run in 2012, but because of Sandy that didn’t happen so this one will be my second. Which physical therapist do you see at SPEAR and what treatments have you been doing for training? Kellen is my therapist at SPEAR. I initially came to see him due to a stress fracture. Since then he has been helping me stay strong for this year’s marathon. We have been doing a lot of stretching, balance and strength training. Improving my core strength has played a key part in my treatment as well as some drills to improve my running form. Do you have any words of wisdom or training tips for anyone thinking about doing their first marathon? If you have that itch to run a marathon you should absolutely go for it. The sense of pride and accomplishment that you feel when you cross the finish line is difficult to even put into words. The longest run I had ever done before I started training in 2011 was maybe 7 miles. If you put your mind to it, you can absolutely do it. Take it slow; don’t build up your miles too quickly. The early morning wake-ups, the aches and pains, are all worth it in the end. It’s our second annual Marathon Month, a time we get to spotlight our patients who are running this year’s TCS New York City Marathon! 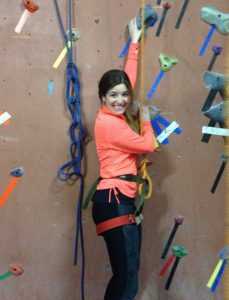 In this entry we check in with 44th Street SPEARunner Rebecca Genter, who has overcome hip pain and IT Band Syndrome while training for her very first full marathon! Why do you run? Running has always been the easiest way for me to stay in shape. I moved to New York this spring, and still haven’t joined a gym because I run outside for most of my work outs. Running is also a great way to explore a city. When I go for an easy run, I don’t map out a path beforehand. I will have a mileage goal in mind, but since training for a race can be a little stressful, adding new things like discovering new neighborhoods can make the process a little more entertaining. How long have you been running marathons? This will be my first full marathon! I was a runner in high school, and began running 10 mile races after I graduated college. I completed my first half marathon this spring in a record-breaking rain storm in Philadelphia. 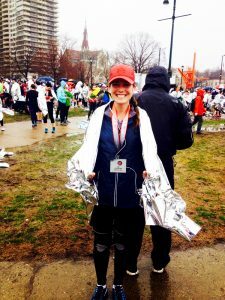 A full marathon had always been a “bucket list” item of mine, and after running the half in pretty horrible conditions, I figured it couldn’t get much worse. Praying for gorgeous weather on November 2! Which physical therapist do you see at SPEAR and what treatments have you been doing for training? I started going to Brendan Vint in early August, about 12 weeks before the NYC Marathon. I initially went for some right knee pain (Patellar Tendonitis and Iliotibial Band Syndrome), which turned [out to be] left hip pain (Piriformis Syndrome and Labral Cartilage Tear) from compensating my stride. Brendan has helped me learn that many of the issues I have are common for runners, so I am in good company! During my sessions with Brendan I work on hip and core strengthening, balance/proprioception exercises, and lower extremity flexibility work consisting of dynamic stretching, static stretching, and foam rolling. The love/hate relationship in physical therapy falls in the manual soft tissue releases, but I know it’s worth it. Do you have any words of wisdom or training tips for anyone thinking about doing their first marathon? Strength train early! My biggest frustration throughout the training process was knowing that if I had put in the time to work on strength training before I increased my mileage, I most likely could have avoided some injuries. I thought I could get by with just running a few days a week with an occasional yoga class, but that was not the case for me. Core work and glute work were key in my training plan so that my legs could handle the high mileage days. Also, my foam roller became my best friend while training. I traveled with it all summer! SPEAR's Kellen Scantlebury Shares Running Tips at JackRabbit Union Square!Yoga, Yoga Everywhere! How To Practice Yoga Safely With Tips From SPEAR's Phaeleau Cunneen!#Backtolife Exercise: Side-Lying Clam ShellsTop 5 Tips from SPEAR's "Running For Life: How to Keep Doing What You Love, Injury Free! "SPEAR to Host Runner Appreciation Event for Action for Healthy Kids To Honor 2014 NYC Marathon Runners!SPEAR's Amelia Rivera's IRONMAN Race Report!SPEAR's Laura Muzzatti PT, DPT and "Girls on the Run" Help Young Girls Find Their Stride!#BacktoFatherhood with RockTapeSPEAR Competes in NYU's Ortho Team Challenge to Get Children With Muscular Dystrophy #Backtolife!Is Barista Elbow the New Tennis Elbow?NYC Artist Gets His Voice Back at SPEAR Physical TherapySPEAR Teams Up with Crutches 4 Kids For Second Crutch Drive!Edwin Ramos, SPEAR PT Tech and Newly Minted NFL Free-Agent, Uses His Sports Experience to Get Patients #Backtolife!Pilates-based Physical TherapySPEAR is Competing in This Year's NYU Ortho Team Challenge to Get Children With Muscular Dystrophy #Backtolife!SmartCEO Chooses SPEAR for New York's Inaugural Future 50 Award!Recognizing #NYCSPEARIT!Maxim Editor Has a Ball Getting #backtolife at SPEAR!SPEAR Helps Teresa Randolph Conquer Mt. Kilimanjaro!